WTF? This is TD game code, not Stuff about SHPs, where do you get this stuff? Are you gay by any chance? Because acting like a woman and deleting all your posts and having a gay avatar shure makes me suspicious. In the preferences, Add default option for Zoom Factor and default Palette. WTF? WHAT ARE YOU ON ABOUT????? Ignore anything in the file...it will change. HAHAHA, I'm finished with you...ALL OF YOU!!! If you open WOODICNH.TEM in Hex Workshop or MixMan, this is the first line of its Hex Code Values. My question is...how does this info relate to the Woodicnh.tem file...all it is is an image consisting of color values...although if you convert them to dec..they don't equal any values on the .tem palette nor do they match any RGB values...so what do these hex values stand for. (if I change the first 2 digits (01) to something else (say 00)...what does that do? If I understood what each hex value in every file (including the C&C95.exe...) represented...then I could get somewhere other than nowhere. Here is a screenshot taken with FRAPS to show the graphic bleeds in C&C95 1.06b patch. Whatever it is that causes this error to occur (refresh rate not keeping up with rate of movement?) I hope its fixed in the new release. Refresh area too small. It's controlled by one boolean in the unit options, which makes it refresh an area of more than 24x24 pixels. This option seems to be disabled in that game. Are you sure you didn't somehow restore the normal 1.04 exe after patching? But um, 1.06b isn't out yet, and I fixed that in 1.06a already. 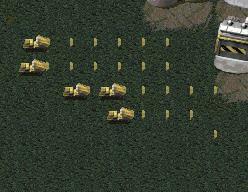 In fact, that option is now activated on ALL units. As for your bizarre study of the woodicnh.tem... SHP is compressed. It's not a bitmap. That first row of bytes can only tell you the dimensions and the amount of frames. Oh, and Banshee, why can GUESTS attach stuff on this board? Isn't that asking for trouble? So, um, why the heck did you post that? If I place before you the Tree of Knowledge, the Tree of Life, and the Tree of Knowledge of Good and Evil, which would you choose? Well, I'm doubting between the Tree of Knowledge and the Tree of IP ban. You are right. Problem sorted. The Tiberium Tiles aren't accurate in CCMAP 3.1. 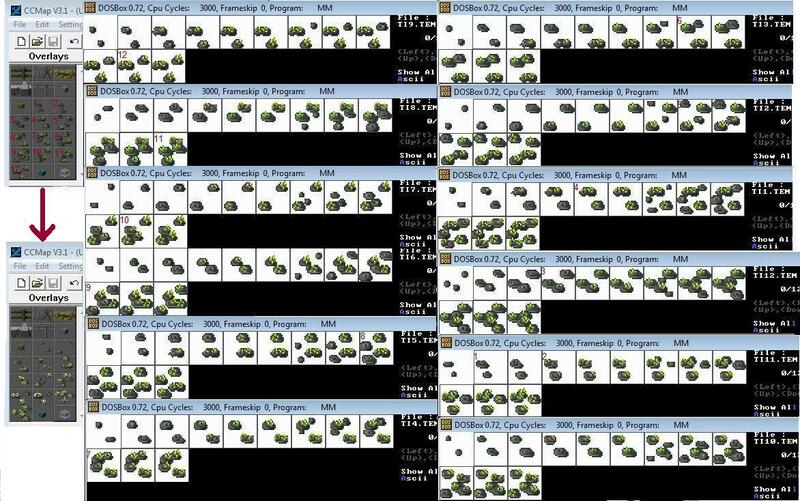 Anyone have the Formula for the Credit Data to all Tiberium Frames? At first I wanted to do Frame #/100 = Credit Amount but that's not it, Or Each Frame = 700/12 = 58 1/3 credits, Neither are it. As far as I've seen, the tiberium growth state is related to the density, just like in RA1. I'm sorry, I got here late. What is this thread about? How do you use these .cscheme files? What's with the dashes, the icons, and the trees of life, knowledge, and evil? I'm getting really confused here. P.S. 30 days before it's considered a bump on PPM, right? This was mainly an exchange of TD ideas between Burton (who deleted a couple of his old posts) and Nyerguds, mainly related to colour schemes.